The confusion sparked controversy, when a routine DOH (Department of Health) inspection on February 4th, led to CBD infused cookies to be embargoed at a NYC eatery. As food service operators scrambled to make sense of it all, DOH justified enforcement by pointing to a decision made by the FDA (Food & Drug Administration), the FDA cited the 2018 Farm bill, and everyone else wondered, why weren’t operators provided with any guidance with respect to complying with these rules/laws/codes. And if CBD was legal, why was DOH issuing fines and embargoing CBD infused foods at a handful of NYC restaurants? While Hemp is a cannabis like marijuana, unlike marijuana it produces low levels of THC (the compound in the plant that’s responsible for getting you high). Before the 2018 Farm Bill, Hemp was not differentiated from other cannabis plants, which were all in the same controlled substances class as heroin. The 2018 Farm Bill defined “Hemp” as a cannabis plant that cannot contain more than 0.3% of THC, removed it from the DEA’s Controlled Substances Act, and legalized it. What’s CBD and why is it everywhere? Cannabidiol, better known as “CBD”, is a non-psychoactive compound found in hemp plants that claims to help with conditions ranging from anxiety to fighting cancer. While that sounds like a stretch, the FDA has approved cannabidiol as a prescription drug (Epidiolex) for the treatment of seizures for two rare and severe forms of epilepsy. When the 2018 Farm Bill legalized Hemp, CBD derived from Hemp became legal as well. While the regulation made CBD easier to sell, it preserved the FDA’s authority to regulate it. 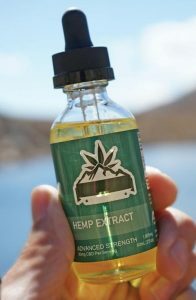 In December 2018, the FDA made its position clear by issuing a statement that prohibited companies from adding CBD to food and drink. While the FDA does not inspect restaurants, its Food Code is used by DOH inspectors when conducting inspections to ensure that food is being kept at safe temperatures and in safe conditions in order to prevent foodborne illness. When the FDA prohibited adding CBD to food and drink, it made it unlawful under the Food Code. Which is the same code that must be complied with under the NYC Letter Grade system. So is CBD legal or not? Depends who you ask, what business they’re in and what their preferred use is. Restaurants, bars and all other food service establishments are not legally allowed to sell CBD infused products unless the FDA adopts new rules. DOH has now given food service establishments until July 1st 2019 to stop offering food and drinks infused with CBD. Any food/drinks found not in compliance by health inspectors will be embargoed (which is a really scary word for food being placed in a plastic bag with a huge Embargo sign on it), destroyed, or sent back to the supplier. Starting October 2019, DOH will begin issuing violations in the form of fines and points that count towards the letter grade, to any establishments found not in compliance. Oh, and the fines given to the handful of restaurants that were inspected earlier this month… we hear DOH is going to withdraw them.